(2) McKean himself, illustrator of the awesome Arkham Asylum among many many other stupendous things, answered my plaintive tweet with the information requested, information he himself had only come by after producing the artwork and naming it, in desperation, “Méliès.” He has since been show authentic documents establishing beyond doubt the film’s true title and authorship. Thanks to both of these Extraordinary Gentlemen. I love not only the fact that my quest had a happy result, but that it depended for that outcome upon a renowned artist being inspired by the same photograph as caught my eye. My sole remaining task was to procure a copy of the elusive masterpiece, and this I proceeded to attempt. BUT! I met with no success. The film does not appear in the Flicker Alley box set, for which information I must thank (3) Shadowplayer Brandon, which I learn from (4) Glenn Erickson’s typically informative and lively review contains “nearly all of Méliès’ surviving films.” Nearly all, but not quite all… I somehow doubt Flicker Alley’s acoompanying booklet will supply us with names of those films which do survive but are not included in the collection. They’re good, Flicker Alley are, but nobody’s THAT good. Here is the IMDb review for Méliès’ LA PHRENOLOGIE BURLESQUE, aka THE PHRENOLOGIST AND THE LIVELY SKULL. Thanks, Gorbo! Can I just say that I particularly admire the phrase “walnut cabinet”, in part because it makes the think of a little cabinet hewn from a single walnut, and in part because it makes me think of the glorious Victorian craftsmanship of Rod Taylor’s chronoperambulator in George Pal’s film of THE TIME MACHINE. But, sad to say, I have been unable to ascertain for certain, as yet, whether this films exists or does not exist. It’s like Schrödinger’s cat. If it exists, I can find it, probably. 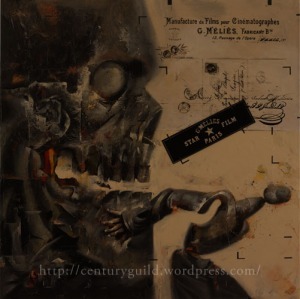 If it partially exists, the somewhat elastic rules of my See Reptilicus and Die quest (whereby I must view every film depicted in Denis Gifford’s A Pictorial History of Horror Movies) allow me content myself with viewing whatever there is of it. That’s what I’m going to have to do with BALAOO THE DEMON BABOON. If the film is completely lost (and bear in mind that when Le Grand Méliès quit movies, he destroyed all the films in his possession), I have several options. 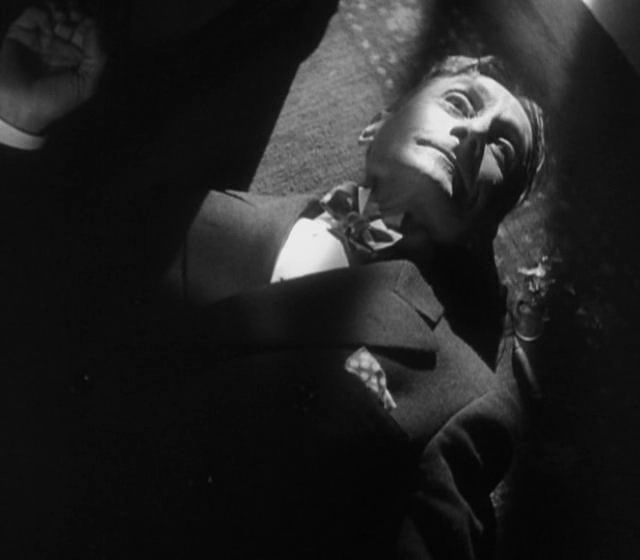 In the case of LONDON AFTER MIDNIGHT, the Tod Browning-Lon Chaney Scooby Doo vampire-detective flick, I can tick that one off my list because I’ve seen a reconstruction of the film made from stills. No reconstruction may exist of LA PHRENOLOGIE BURLESQUE, but there’s nothing to stop me MAKING ONE, using the single still, Mr McKean’s artistic riff on it, and my own imagination. Alternatively, I can do what I did with THE MOUNTAIN EAGLE, Hitchcock’s lost film, for Hitchcock Year — either dream the film, or get someone I know to dream it for me. These are all legitimate solutions. 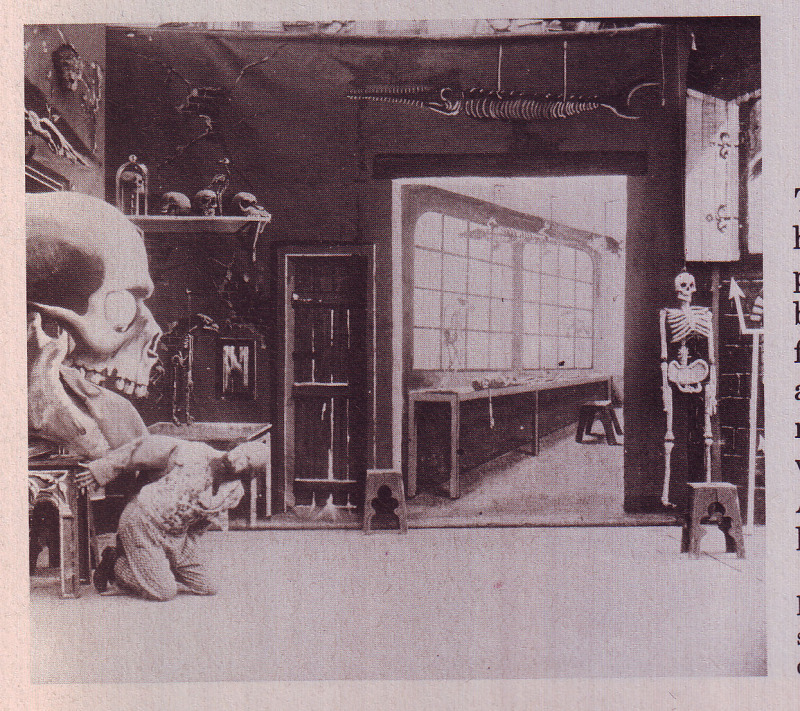 I fully realize that, ideally, while dreaming the film, I should have my skull measured by Mr Lavery and Mr White’s psychograph, and if I can arrange such a thing you can rely on me to make it happen. But I would not feel right in myself, enacting any of these solutions, without first establishing for a definite fact whether the putatively lost film is in fact lost. Over to you, archivists of the world. Unsatisfied ciné-phrenologists are referred to the Beatles cartoon YELLOW SUBMARINE, which contains an entire SEA of Phrenology. Nearly missed this! A quick post to squeeze in under the wire. 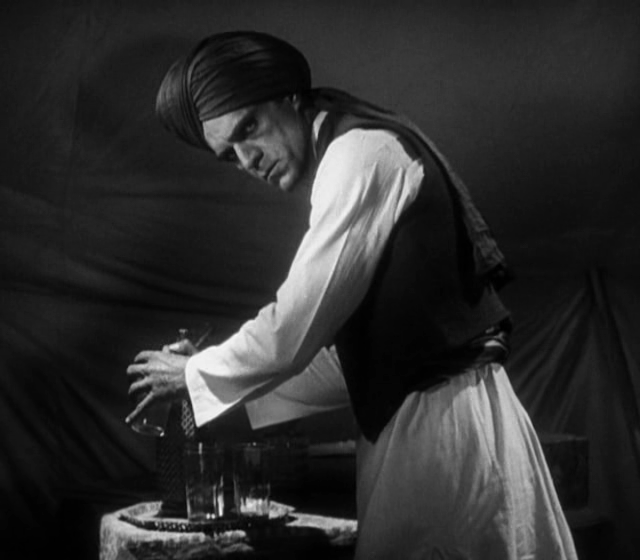 I’d elected to watch and write about BEHIND THE CURTAIN, a 1929 mystery story which casts Boris Karloff as an Indian manservant. A few things commended the movie to me. Firstly, I’d enjoyed Tod Browning’s 1929 thriller THE 13TH CHAIR, and was eager to sample more of the creaky, crackly delights of the early talking era. Secondly, I’m fascinated by pre-FRANKENSTEIN Karloff, the best example of which is probably his role in Howard Hawks’ THE CRIMINAL CODE, where he slowly stalks an opponent with all the zombified lumber and menace of the Famous Monster. Thirdly, BEHIND THE CURTAIN is the first ever Charlie Chan movie — sort of. 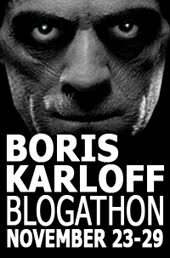 “…or my name’s not Boris Karloff.” That catchphrase, from the intros of Boris Karloff’s Thriller, the 1960-2 TV show Boris presented, is an amusing one, since Karloff was actually named William Henry Pratt. And in a similar way, his casting as an Indian character in BTC is amusing, since his father was Anglo-Indian, a fact that seems to have been kept fairly secret during Boris’s career. So here’s an Anglo-Indian actor with a Russian name pretending to be a white man pretending to be an Indian. Boy oh boy this movie moves slowly! Which allows us plenty of time to assess the stupidity of the plotting. London. A private detective is murdered. Said flatfoot was gathering information on two chaps, Warner Baxter and Philip Strange, both of whom were suitors of the same girl, Lois Moran. The only clue is a pair of Chinese slippers jammed onto the corpse’s feet by the killer. It’s Poole, from the Mamoulian JEKYLL & HYDE! At first, our suspicions are evenly divided. True, Warner Baxter is a known movie star, but who knows what he was capable of in 1929? Whereas Strange is just strange. But soon it becomes clear that Strange is the killer, and he’s married the poor girl. Relocating to India, he blatantly carries on an affair with the maid, Nuna (Mercedes de Valasco, a common Indian name I’m sure), and becomes enraged when his wife learns his secret. Meanwhile, Sir Frederick Bruce (Gilbert Emory) of Scotland Yard has learned that the slippers belonged to Baxter (he doesn’t LOOK like a man who’d wear Chinese slippers, but there it is). This practically proves Baxter’s innocence, since why would he deliberately leave his own property behind at the crime scene? Yet it takes the plodding Sir Fred another YEAR to solve the case. His informant on the slipper situation is Charlie Chan, world’s second greatest detective (after Sir Frederick, we are told — God help us all). 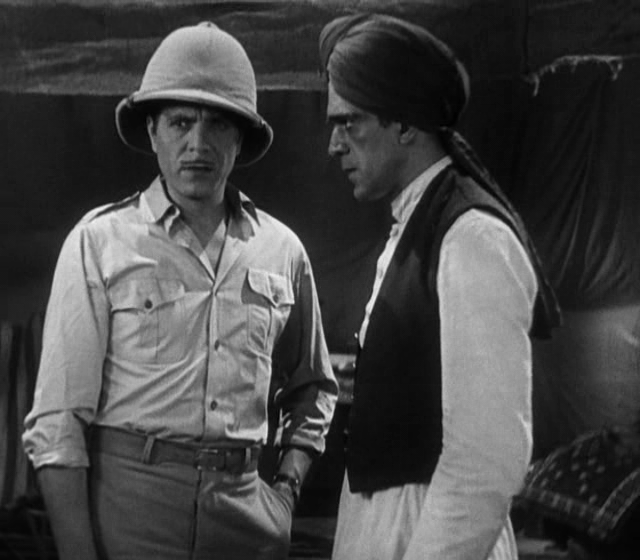 But Chan doesn’t appear until the narrative has trudged its way through Persia, where Karloff turns up as Baxter’s faithful stooge, and from there to San Francisco. Acting. There’s a lot of it, of course, and all in that ponderously enunciated 1929 style, where the microphone gives the direction. They could practically attach strings from the actors to the boom and let it yank them about. Director Irving Cummings is well served by photography and design, and in a moment of exuberance attempts a tracking shot, but soon has trouble with moving shadows at the edge of frame and reverts to stasis. So what life the film has must come from the cast. So we’re in trouble. 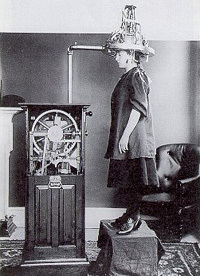 Lois Moran gradually unstiffens about 20%, so she can show some emotion when hysteria is called for. Baxter declaims, and tries to sound less American than he is, with reasonable success, but he’s still robotic. Emory (or Emery — credits differ) is hilariously stultified. Karloff excels here, since his character is meant to be rather sepulchral, intoning things like, “The desert gives… and the desert takes away.” He’s the only player who can actually situate a dramatic pause somewhere in a sentence that makes sense. But his effectiveness is somewhat reduced by the fact that everyone else in the cast is acting as if under deep hypnosis. The qualities that should make Karloff’s Indian stand out cause him to blend in. Still, he has a sinister way with a soda syphon. 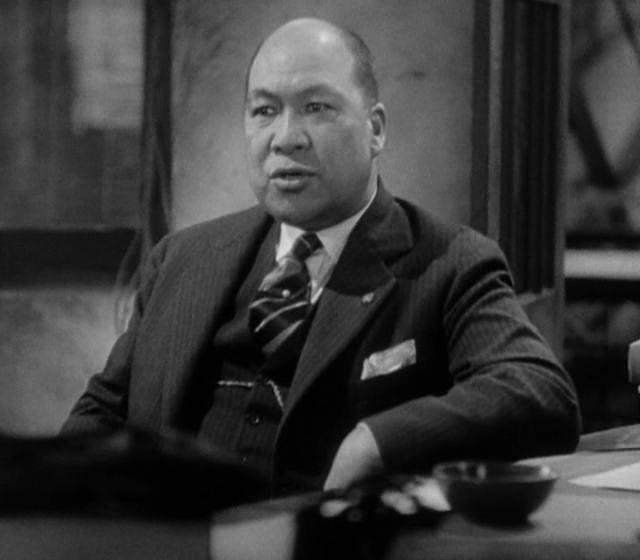 The film’s crowning glory is the eventual appearance of Charlie Chan, played by the mysterious EL Park, in his only film. Park is the only oriental actor to have played Chan (NOTE: see comments for correction), although I’m guessing from his name he’s Korean rather than Chinese. He’s wonderful! Fluent and convincing when he babbles away in his native tongue, he becomes hilariously maladroit in English. His pauses are both random and voluminous. “Honorable. Excuses… Sir. Frederick.” he intones. When Sir Fred is speaking, Park’s eyes dart around the set in panic, taking in the crew, the camera, painting a retinal portrait, for our benefit, of the whole studio. 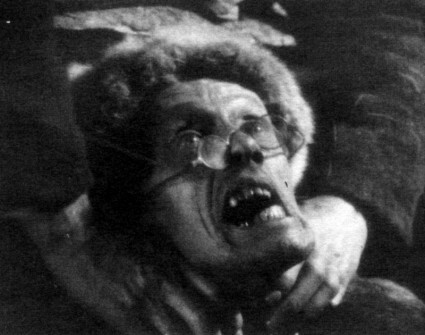 Park succeeds, where Karloff could not, in blowing a hole in the film’s consistency of style, which is one of suffocating lack of imagination. Through his sheer amateurishness, this glorified walk-on ennobles and illuminates his surroundings, offering us our sole glimpse of recognizable humanity. I love this man! Can somebody tell me more? Park’s history — even as to whether he was in fact an actor at all — is unknown, but it seems like I might have some luck where others have failed: I’ve already made contact with Charlie Chan’s grandson. 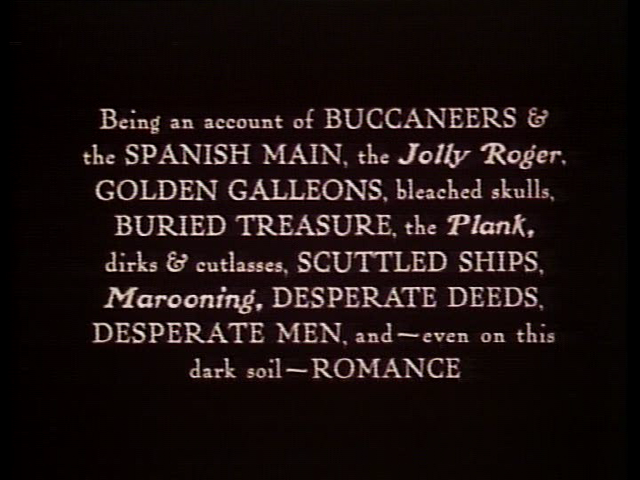 So, I first saw Douglas Fairbanks sliding down a ship’s sail he’d skewered with his short sword in THE BLACK PIRATE when I was a teenager, and the clip was in Kevin Brownlow and David Gill’s monumental series Hollywood. Accompanied by information on how the filmmakers cheated so that Doug could do the impossible. It’s taken me, I guess, twenty-nine years to actually see the movie. I can’t think of anything else in my life that’s taken that long to achieve. Oh, except all the things I’ve yet to achieve. 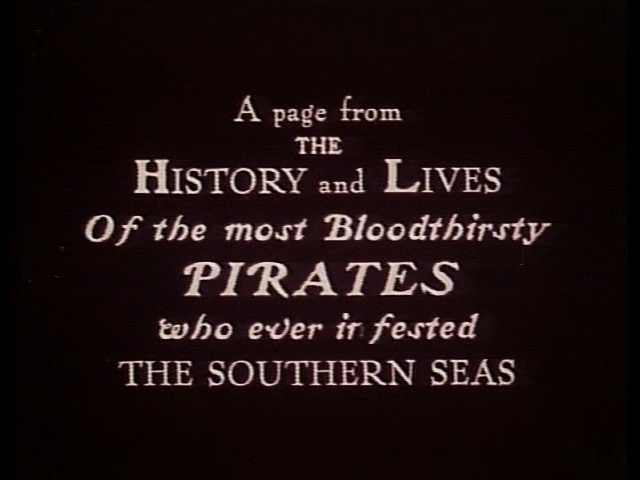 Lots of good pirate slang: not just “scurvy” and “me bullies,” but “labnacker,” a term I had not previously encountered. Also, a comedy Scotsman who comes over to Doug’s side, played by Donald Crisp (born in London but he must have had Scottish roots: he’s in Disney’s GREYFRIARS BOBBY). His history of looting and murder is conveniently overlooked. 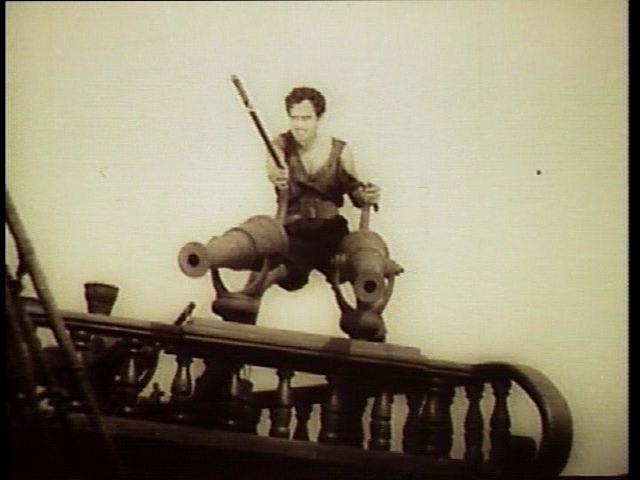 Highlights include Doug capturing an entire merchantman vessel single-handed to impress the gang, and the invasion of Doug and his shark-finned soldiers, swimming underwater in a vast special effects shot: they’re all suspended from wires, with superimposed bubbles drifting upwards in the foreground. 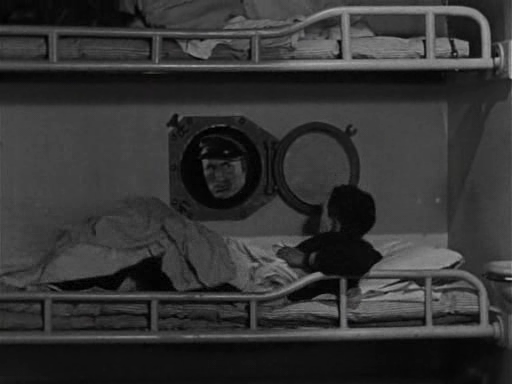 The man in the portrait is Donald Crisp.